If you are looking for the perfect combination of sightseeing and relaxation then Selcuk Pamukkale Tour is the ideal option. This full day, all-in-one excursion offers a unique exploration Pamukkale, which forms a natural wonder and a World Heritage Site. Enjoy nature at its best, relax and learn the place’s history by participating in this trip. Our tour starts in the morning with a free pickup service from your hotel. 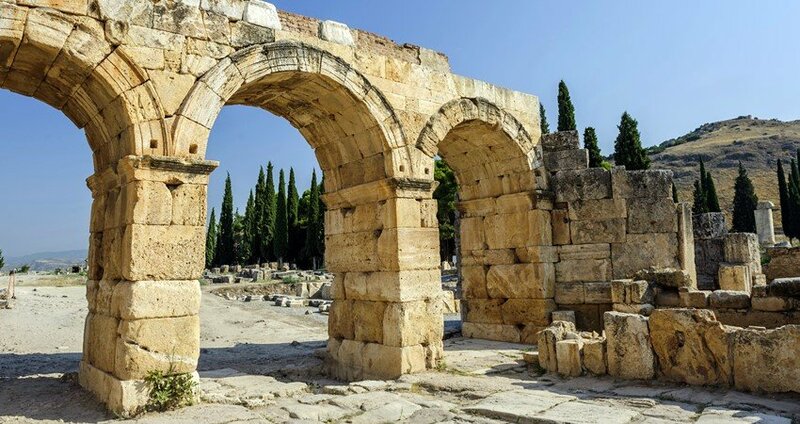 Depending on the scheduled time of your excursion, our team members will pick you up from your hotel in Selcuk. You will be traveling in a modern, comfortable and fully air conditioned bus. During the excursion you will be accompanied by a professional and fully licenced tour guide who will be in charge to assist you and provide important information regarding the places of interest. The bus trip will have an approximate duration of three hours and several stops will be made in order to relax and snap some photos. Once you arrive at Pamukkale there will be a 3-hour free time session. During your free time, there are several things you can do in Pamukkale. 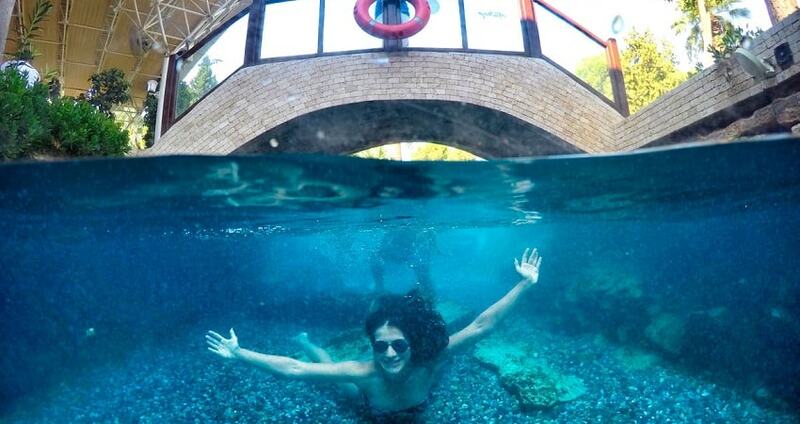 For example, swimming in the pool of Cleopatra or visiting the ancient city of Hierapolis & Necropolis. There, you can also find the infamous Cotton Castle ( White Travertines). It is one of the most famous tourist attractions in Turkey and is called Cotton Castle due to its shape and color. It is a naturally shaped white mountain where people can walk. It has thermal water springs that flow and fill white terraces with water which in turn form a spectacular landscape. You can enjoy swimming or just admire the setting and snap photos. The ancient city of Hierapolis was important healing center, as the waters of the area were offering the perfect spot for baths. 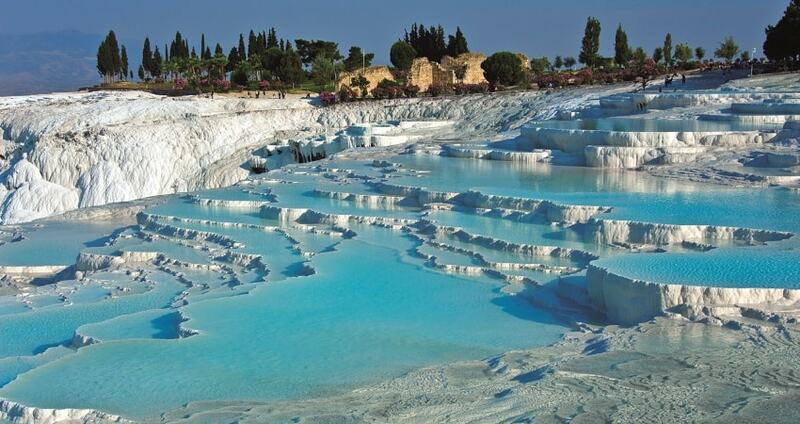 Pamukkale was one of the most important spiritual, creative and commercial center of the ancient world. Visitors today can observe the ruins and admire the place’s historical importance. Finally, the Cleopatra Thermal Pool is another famous attraction in Pamukkale. 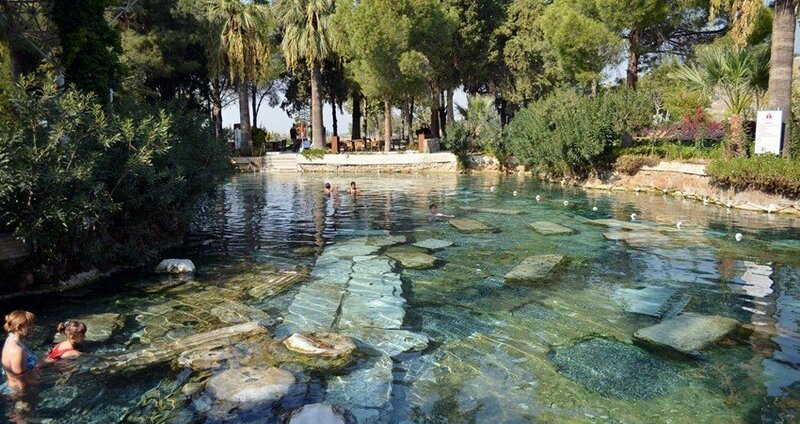 In fact, it is a natural pool with hot springs which was used during the Roman period for treatment purposes. After spending your day at Pamukkale , the bus will continue on its way back during the afternoon. This amazing a tour ends by the time participants reach their hotels back in Selcuk. At the end of your day, you will be full of emotions and enthusiasm. Relaxed and satisfied from your participation, this excursion will be a notable moment in your holidays. If you are packed up and will leave the bus in Pamukkale Town, you may like to check out our excursions from Pamukkale. You may like to take a Balloon Ride over Pamukkale or fly through white travertines with Paragliding. 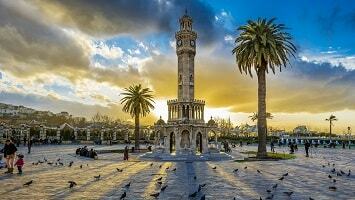 We have pickup service from İzmir Airport for this tour. Towel, Swimsuits, Hat, Sun Cream, Sunglasses, Camera. Please Bring Passports of Your Children and Infants. This Tour is Not Suitible For Guests With Walking Difficulties. If you will stay overnight in Pamukkale, check out our Pamukkale Balloon Tour. 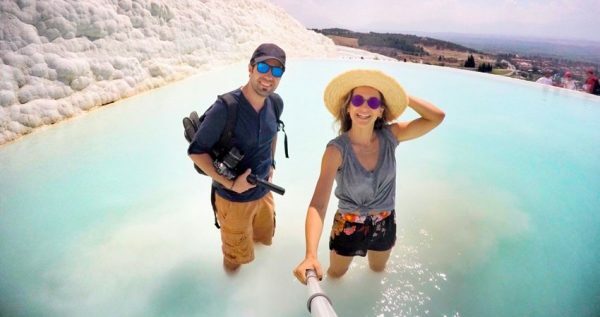 Explore Pamukkale and enjoy nature at its best with the exciting and relaxing Selcuk Pamukkale Tour. This full day exploration includes historical points of interest, beautiful landscapes and thermal springs. 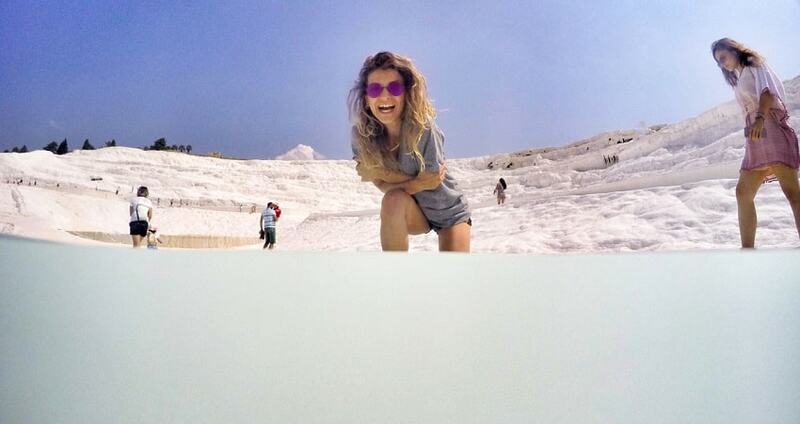 Pamukkale Day Trip will take you to one of Turkey’s most famous attractions and make you fall in love with nature. Selcuk Pamukkale Tour starts in the morning. Depending on the scheduled time, our team members will pick you up from your hotel in Selcuk. You will be traveling in a comfortable and fully air conditioned bus accompanied by a tour guide. The professional, fully licensed and experienced guide will ensure that you enjoy a smooth and pleasurable experience. In addition, the guide will provide important information regarding the places that you are going to visit. The bus trip to Selcuk to Pamukkale will have an approximate duration of three hours. Several stops will be made in order to take a break and snap some photos. 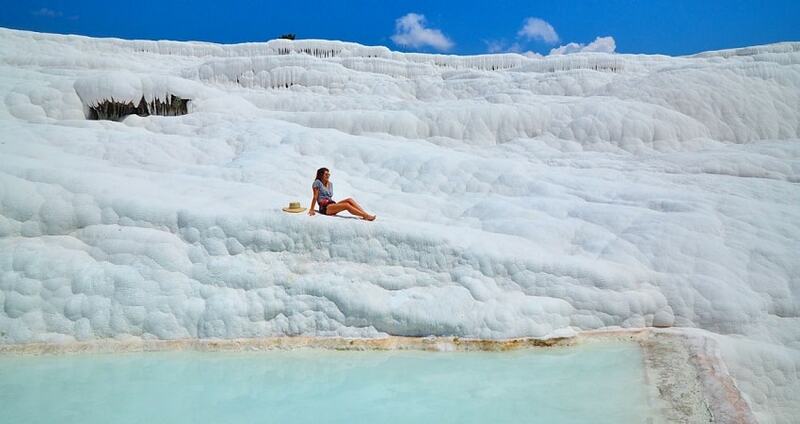 Once you arrive at Pamukkale, you will have 3 hours of free time to spend as you wish. There are several things you can do depending on your interests. 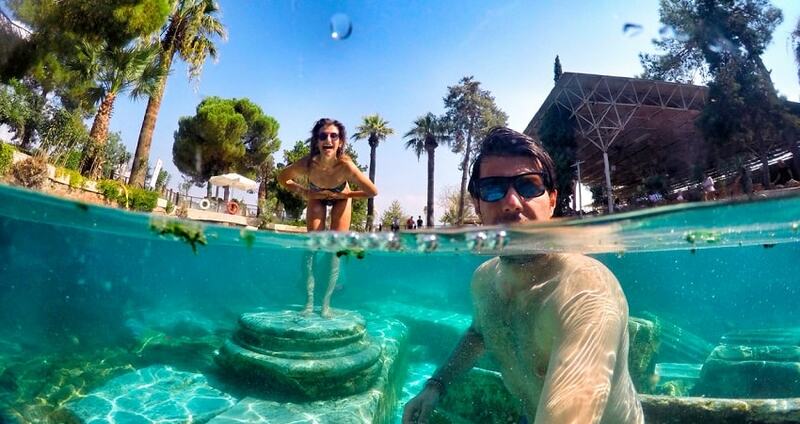 Those who wish to relax can enjoy swimming in the pool of Cleopatra or visit the Cotton Castle. 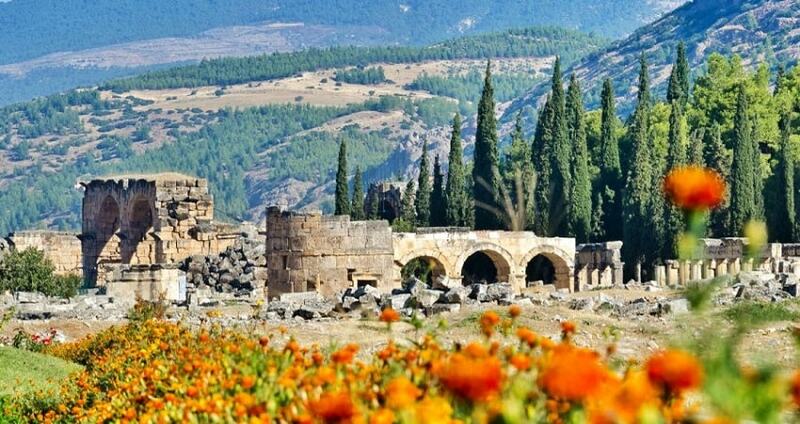 If you wish to discover the place’s history you can visit the ancient city of Hierapolis or the Necropolis . Forming one of Turkey’s most famous attractions, the Cotton Castle or the Travertines will impress you. It is a naturally shaped white mountain with water springs that flow into white terraces. People can walk or enjoy swimming there. The scenery is spectacular so take a chance to snap some stunning photos. In what regards the ancient city of Hierapolis, it was established as a curing centre during 190BC, due to the existence of hot springs nearby. In the Roman era, the area was one of the most important spiritual, creative and commercial centres. Nowadays, there are ruins of the ancient city and people can understand the importance of this place by walking around the ancient city. Cleopatra Thermal Pool is an additional attraction in Pamukkale. It is a big natural pool with hot springs waters. In the ancient world people understood the importance of hot springs in treating deceases and used that one for treatment purposes. People can swim inside and enjoy the hot spring waters even today. 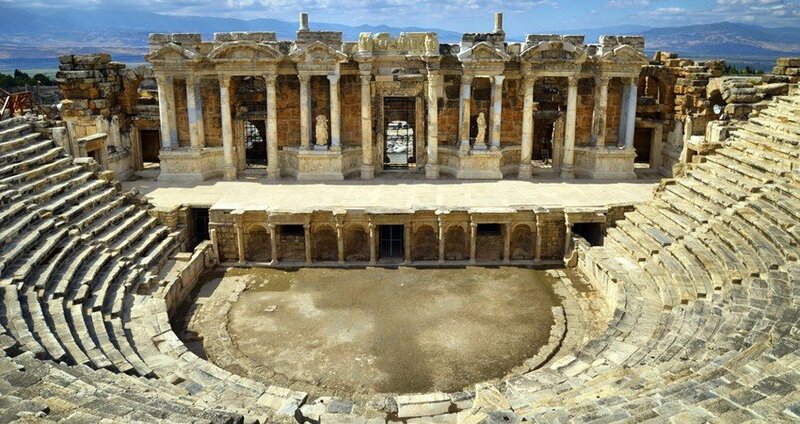 Selcuk Pamukkale Tour comes to an end during 16:00 when the bus will start on its way back. There is an option for those who wish to stay in Pamukkale, as they can leave the bus at the village. 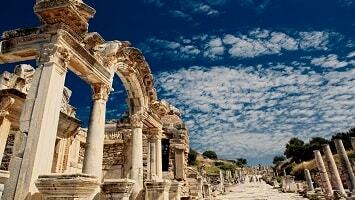 For those who wish to return back, Selcuk Pamukkale Tour finishes once you reach your hotel.